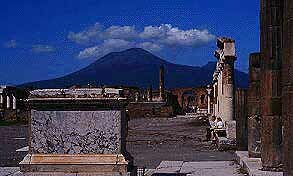 A thriving city in 79 AD, Pompeii was in the laid out in a standard grid pattern, with luxurious baths, and a large Forum. Among its buildings surrounded by temples and municipal buildings were the Basilica, Temples of Apollo, and Jupiter. 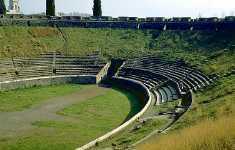 Pompeii had two theaters: the Odeon, built between 80-75 BC, used for musical recitals and mime-shows; and the Large Theater, with seating for 5,000 spectators, which dates from the Hellenistic period between 200 and 150 BC. 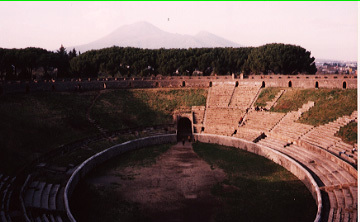 For even large entertainment, Pompeii also had a Colosseum. 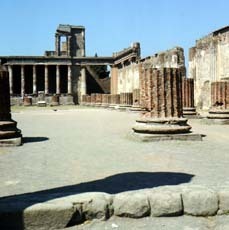 The Forum, a vast rectangular square, was the fulcrum of the political, religious and economic life of the town, and is bordered by the main public buildings. As was generally the case in places under Roman control and influence, the Forum was a central gathering place, with colonnades lining both sides and the south end. The Temples of Juno, Jupiter and Minerva were on the north end of the Forum, with and the Temple of Vespasian on the east side, along with the Eumachia Building. Temples of Apollo was located on the west side. Also located on the west side, near the south end of the Forum, was the Basilica. 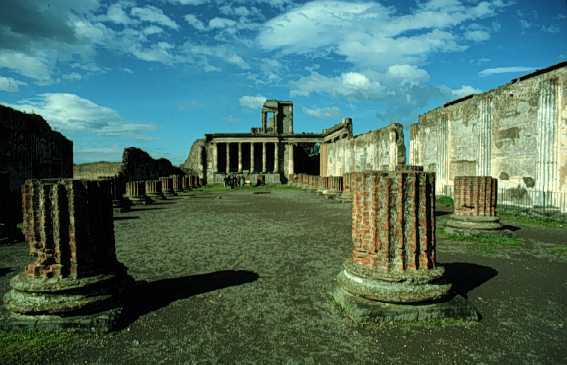 The Basilica was the oldest and most important public building in Pompeii, dating from about 120 BC, and the earliest known example of a type of building destined for a lone and honorable history. In the beginning, it was a covered market, and a meeting place. However, during the earthquake of AD 62, the roof collapsed. 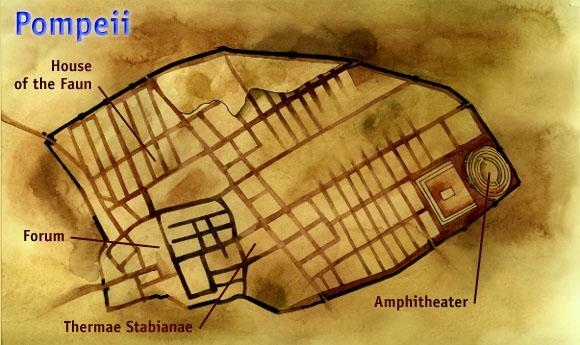 It then became an open-air market, and finally, the seat of the judicial system for Pompeii. The Eumachia Building was, in this case, Eumachia's gift of a building to the city of Pompeii. However, the building is actually dedicated to Concordia Augusta, and to Pietas. The daughter of Lucius Eumachius, Eumachia was a public priestess. In her own name and in the name of her son, Marcus Numistrius Fronto, she built at her own expense the chalcidicum, the porticus, and the crypta. The chalcidicum is the front zone, which is in front of the facade. The porticus is the portico on the interior of the building, that is, the covered colonnaded space surrounding the central open court. The crypta is the corridor behind the porticus but connected to it by windows and two doors. Instead of the dedication inscription stating that Eumachia had the building built, the inscription instead names the three parts of the building, and who the building was dedicated to. For a closer and more detailed image of the building, just click HERE To see a large image of the interior of the Eumachia Building just click HERE Please be patient: this image takes TIME! To see a closer and more detailed image of the inscription dedication, just click HERE to see the left side and HERE to see the right side. Pompeii has the second-largest ancient Colosseum in the world, smaller only than the Colosseum at Rome. In the background above the Colosseum, was the looming figure of Vesuvius, the volcano which buried it nearly two millenniums ago. Adopted from the earlier Etruscans, perhaps by way of Campania, gladiatorial combats originated in the rites of sacrifice due the spirits of the dead and the need to propitiate them with offerings of blood. They were introduced to Rome in 264 BC, when the sons of Junius Brutus honored their father by matching three pairs of gladiators. Traditionally, the munera were the obligatory offerings owed to important men at their death, but they did not have to be presented then. In 46 BC, after recent victories in Gaul and Egypt, Julius Caesar commemorated the death of his daughter Julia, who had died in childbirth eight years earlier, with elaborate games at her tomb. In 65 BC, there had been an even more lavish display. When, in honor of Julius Caesar’s father who had died twenty years before, three hundred and twenty pairs of gladiators fought in silver armor. “About this time there was a serious fight between the inhabitants of two Roman settlements, Nuceria and Pompeii. It arose out of a trifling incident at a gladiatorial show. 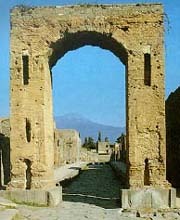 The Arch of Caligula is a smaller structure that still stands in Pompeii, and through the archway can be seen the ominous image of Vesuvius, the destroyer of Pompeii.